Thank you all for joining us for Summer Camp this past weekend. It was yet another fantastic event, and we want to be sure to say a big thank you to all of the instructors who volunteered time out of their busy schedules to prepare for and teach during this year's camp. As promised, we have prepared a survey for all WYKKO members to fill out. If you just attended Summer Camp, we'd especially like your thoughts on how the camp went and how it can be improved. But even if you weren't able to attend, we're asking you to fill it out and let us know how we can improve our camps generally in the future. Best of all, our survey is extremely short - only four questions! So it shouldn't take more than a few minutes of your time. Please take a moment to answer these quick questions so that we can make our camps even better in 2019! "Osu! Summer Camp is just one week away (exciting, right?!). If you haven't made your reservations and registered to attend, go ahead and do that right now. Remember, the deadline to pre-register is June 11th! So go ahead and start planning which classes you want to attend throughout the day. This year, we're especially excited for some additions to our kids' classes. Children under 10 will have the chance to work with Master Culbreth and Master Toyama this year in addition to classes on breaking and sparring as well as perennial favorites such as self-defense and our traditional karate games to round out the day. Every camp we try to bring you new and interesting classes to advance your martial arts training, and this year is no different. Our brand new offerings include Ms. Serrian's Bare Knuckle Freestyle Sparring class, Submissions with Mr. Blumreich, Black Belt Bunkai with Sensei Hofmeister, and Improvised Weapons with Mr. Bishop. But even as we add new elements, we always strive to ensure that popular favorites are also available. So this year, we're bringing back our essential Yoshukai History class with Kaicho, Basics of Iaido with Sensei Lecut, and Environmental Fighting. We're also bringing back our morning run from last year's camp, led by Mr. Girvin. So bring your running shoes and plan to start the day off with an easy mile jog around the beautiful Lakepoint State Park. As always, please remember that kyu grade students under the age of 10 must choose from the classes on the far left of the schedule in white, while students aged 10 or older can choose rank appropriate classes from the rest of the schedule. Students may always attend a class that's below their current rank, but students may not attend a class that is higher than their current rank (except for those who tested for shodan the night before). Please also remember that camps are in many ways about finessing and refining your current understanding of a kata or technique. We find that rushing to learn a brand new kata in forty minutes is tough on everyone involved and doesn't help those who really need to focus on fine-tuning their kata. That's why we require that all kyu-grade students (this does not apply to black belts) at least know how to walk through the kata if they are going to take a class on a specific form. 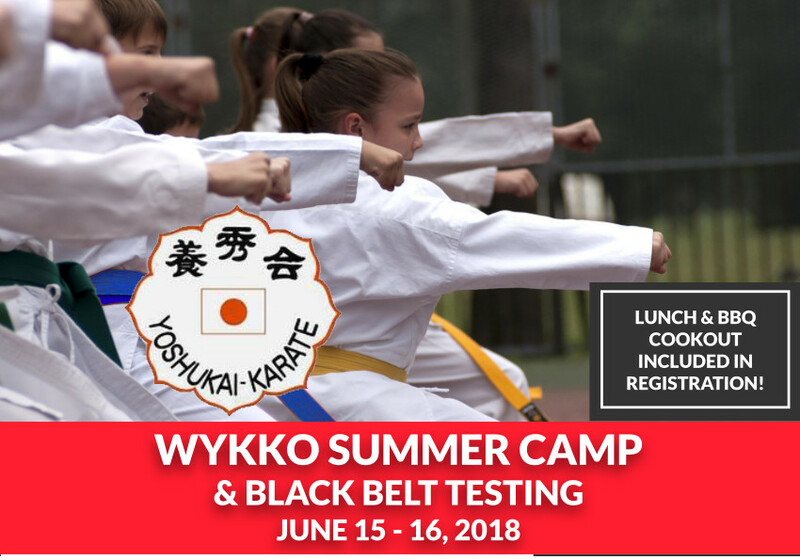 Don't know how to walk through a kata you really want to learn at camp? Talk to your instructor and see if they'll introduce it to you prior to camp. You don't have to be an expert, but you do need to be familiar with it. Advanced Shodan Sai, Japanese Knockdown Fighting, or Mastering Japanese Language. Sai Tai Bo #1-4, Intro Hapkido (for self-defense), or Intro to Teaching Children. These are just some examples and are not inclusive of all options, but we hope it gives you an idea of how you can arrange your schedule throughout the day to make sure that you are getting the most out of your individual training! If you have questions about a course that's being offered or if you'd like help in figuring out what classes would be best for you to go to, feel free to email Ms. Hines at sherrie.l.hines@gmail.com, and she will be happy to assist you. We look forward to seeing you all there! Osu! 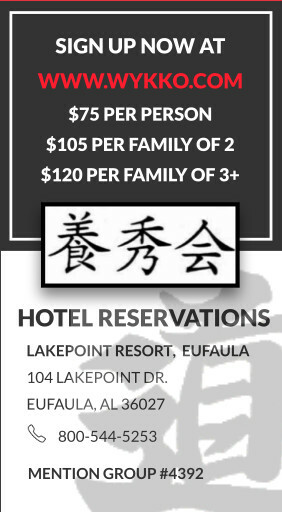 June 15, 2018 - Black Belt testing at Lake Point Resort, Eufaula, AL. Hotel Reservations must be made by May 25, 2018. You can register online at www.alapark.com or 800-544-5253 or 334-687-8011 and the group code is 4392. 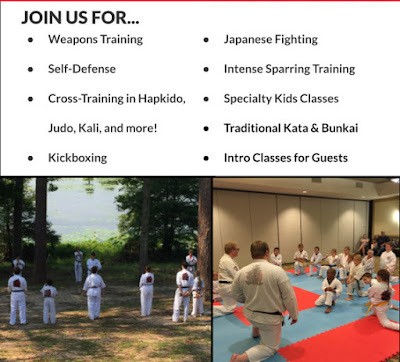 June 16, 2018 - The 2018 Summer Camp and Black Belt testing will be held at Lakepoint Resort in Lake Eufaula, Alabama. For reservations call 334.687.8011 or 800-544-5253 or online at www.alapark.com and use Group #4392. Reservations must be made by May 25, 2018. WYKKO will need your PRE-REGISTRATION BY June 10, 2018 so that we can prepare for the food that will be required. There is no charge for family members to eat, but we do need a head count. The Atlanta Traditional Tournament is fast approaching and we wanted to get the event location and hotel information out to everyone to mark their calendars and make hotel reservations. We hope everyone can attend this year’s tournament. Hotels are difficult to book for group rates in Roswell. They typically will not match corporate rates or internet rates. Also, they will not give us a real discount due to a low room reservation count. We suggest that prior to using the "WYKKO" rate to book a room you check travel websites such as Expedia, Kayak or TripAdvisor to find a better rate at the Best Western (or other hotels). You may also find a better rate by using AAA, AARP or military discount. If anyone has any questions, please feel free to contact us. We all look forward to seeing everyone on the April 14th weekend for a great tournament weekend! Osu! We hope that you enjoyed Winter Camp last weekend. While it may have felt more like Summer Camp than Winter Camp due to the warm weather conditions, we still had a great time getting to catch up with everyone and participate in some excellent training opportunities with many of the highest rank instructors in our organization. We'd love to know what you thought about this year's event, so we've created this quick, online survey: https://www.surveymonkey.com/r/RMNY2KX Please take a few moments to fill it out and let us know what you liked most about this year's camp so that we can make next year's even better! The survey is 100% anonymous, and we have given you the opportunity to explain any of your answers so that you should be able to give us any feedback that you'd like. However, if there's something else that you'd like to let us know that won't fit in the survey (there are some unavoidable character limits), you're welcome to email any other comments to sherrie.l.hines@gmail.com. We also invite parents to fill out a survey about their own participation and thoughts about camp, in addition to assisting their children in filling out a survey from their perspective. We also welcome any suggestions that you have for this year's Summer Camp as planning for that event will begin shortly. Be sure to mark your calendars for June 16th for Summer Camp 2018, and we'll look forward to seeing you there! Osu! "Osu! Our 38th Annual WYKKO Winter Camp is just around the corner, so we hope you've all made your reservations and registered to attend. The official schedule is now finalized and attached to this email, so you can go ahead and start planning for which classes you would like to attend. We're excited to be starting off the day with an obstacle course in place of our normal run for the adults (children will get their turn at the course later in the day). 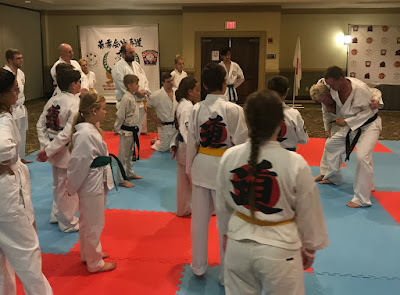 We had an abbreviated "Karate Warrior" obstacle course for the children last year that was a lot of fun for all involved, so this year we're expanding it and letting the adults join in on the fun! We'll also have full-contact sparring classes taught by Mr. Turnbull, who is joining us all the way from Canada. We are very excited that he was able to join us again this year. Mr. Hofmeister will be teaching a brand new class to introduce students to bo fighting, and Mr. Culbreth will be teaching a class on point sparring techniques that's open to everyone. This is always a great opportunity for even our newest students to work with one of our masters. Those of you looking to start the day with a high-energy class focusing on fitness and good technique will enjoy Mr. Mattison's proper exercise technique class, and for those of you who might like to start the day a little slower (that includes you, parents! ), Ms. Elrod's very popular yoga class is back once more. Finally, we have an introduction to knife defense class with Mr. Blumreich that is going to be an extremely fun and educational experience. Remember, if you want to participate in that class, you must bring a white t-shirt that you do not mind potentially damaging. We promise it'll be worth it! Remember, kyu grade students under the age of 10 must choose from the classes on the far left of the schedule in white, while students aged 10 or older can choose rank appropriate classes from the rest of the schedule. Students may always attend a class that's below their current rank, but students may not attend a class that is higher than their current rank (except for those who tested for shodan the night before). Please also remember that camps are in many ways about finessing and refining your current understanding of a kata or technique. We find that rushing to learn a brand new kata in forty minutes is tough on everyone involved and doesn't help those who really need to focus on fine-tuning their kata. That's why we require that all kyu-grade students (this does not apply to black belts) at least know how to walk through the kata if they are going to take a class on a specific form. 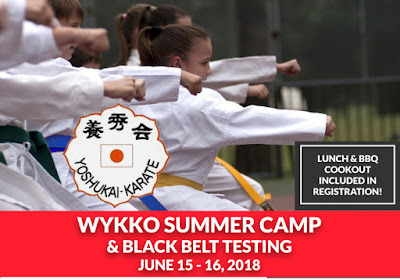 Don't know how to walk through a kata you really want to learn at camp? Talk to your instructor and see if they'll introduce it to you in the new couple of weeks. You don't have to be an expert, but you do need to be familiar with it. Using Joint Locks... is a great course, especially if you don't know Bassai & Chinto already. At future black belt tests, judges will want to see that you can use joint locks to submit an attacker. These are just some examples, but we hope it gives you an idea of how you can arrange your schedule throughout the day to make sure that you are getting the most out of your individual training! If you have questions about a course that's being offered or if you'd like help in figuring out what classes would be best for you to go to, feel free to email Ms. Hines at sherrie.l.hines@gmail.com, and she will be happy to assist you. Tenshin Ryu Hyoho and Yoshukai Iai. In 2014 I spent 2 hours at Mr Culbreth's residence with Soke Yamamoto to discuss Yoshukai Iai with him. Soke showed me some bunkai for some of the waza and we also discussed the origin of Yoshukai Iai. Soke did not learn Iai from Dr Chitose but from 2 different masters from Kyushu. Although I was not always able to fully understand what he was trying to tell me, I understood he had been training in the 2 styles of Tenshin Ryu and Jigen Ryu, and that when one of the masters he was training with died, he quit training in that style. In this Tenshin Ryu video, you can see where some of the Yoshukai Iai moves come from. Although Tenshin Ryu Nodachi is much longer than the regular katana used in Yoshukai iai, the waza at 1:40 is very close to the Yoshukai Waza #8, and the next one at 2:00 is very similar to our #7. Also, Chiburi and Noto are the same.